The Stabat mater by Giovanni Battista Pergolesi is one of the most famous compositions in music history. It was performed well before the emergence of historical performance practice and has been recorded in a wide variety of interpretations, from solo voices with single period strings to operatic voices with a large orchestra, and sometimes a choir. This work dates from the composer's last year when he was suffering from tuberculosis. It was a commission of the fraternity of the Cavalieri delle Virgine dei Dolori in Naples which honoured the Virgin Mary every year with a performance of the Stabat mater during the Lenten season. In 1724 Alessandro Scarlatti had written a setting for the same scoring of soprano, alto, two violins and bc. This scoring strongly suggests a performance by soloists, and that impression is confirmed by the operatic character of the vocal parts. In his liner-notes Leander Diener states: "What is special about this recording of the 'Stabat mater' by the Zürcher Sängerknaben is that their performance skilfully revives historical liturgical performance practice." He then describes the role of boys' voices in liturgical music through the centuries. However, that has little relevance here. It is questionable whether this is a strictly liturgical work. Moreover, the role of boys in Italian sacred music seems far less important than in, for instance, Protestant Germany or England. Much religious music was virtuosic and from the end of the 17th century onward increasingly operatic. It is much more likely that such works were meant to be sung by castratos. Pergolesi's Stabat mater soon gained great popularity, not only in Italy but also elsewhere in Europe. It was sometimes also arranged, for instance by Johann Sebastian Bach. Another German composer, Joseph Eybler, added a choir to replace some of the duets. This seems another token that this work was considered as having been conceived for solo voices. The opening section of the Stabat mater gives a hint at what is to come. The text is effectively expressed through the use of some strong dissonants, but too little of that comes across when it is performed by a choir, as in this recording. The duets 'O quam tristis' (III) and 'Fac ut ardeat cor meum' (VIII) are also performed by the choir. In the latter we find some written-out ornaments which again suggest the use of solo voices. The 5th section, 'Quis est homo' has been divided over solo voices and choir, the latter entering in the closing episode, beginning with the words "pro peccatis". The logic of this decision escapes me. The piece also ends with the choir singing the "Amen". The contributions of the soloists are the best part of this recording. Jonah Schenkel has a beautiful voice and sings his solos quite well. Alex Potter is one of today's best male altos and his solos are very expressive. Their voices blend perfectly in the duets. However, they seem to act on different wavelengths in their solos. Schenkel's contributions are a little short on expression and he doesn't add any ornamentation, in strong contrast to Potter. This difference contributes to this recording's lack of consistency. The instrumental ensemble plays with two violins per part. That seems inevitable, given the participation of a choir. The ensemble plays two concerti grossi by the little-known Giovanni Lorenzo Gregori. These date from 1698, and why exactly these are used to fill this disc is a bit of a mystery. Moreover, they are so short that they can hardly serve to make the playing time of this disc acceptable. I hope that it is not being offered at full price because that is clearly too much for a disc that plays for less than 45 minutes. That would be much less of a problem if this had been a brilliant and highly expressive performance. Despite certain unmistakable qualities mentioned earlier that is not the case. 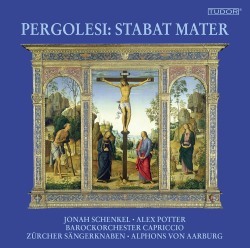 I cannot rate it as a valuable addition to the discography of Pergolesi's Stabat mater. Fortunately there are enough alternative versions from which to choose.